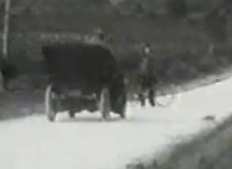 It is not generally realized that the AA was founded as a contingent of cyclists. In March 1905 Mr. Walter Gibbons wrote to Autocar magazine proposing the formation of a Motorists’ Association for the Prevention of Police Traps. Two other motorists replied saying that the Brighton road was already patrolled by cyclists to warn motorists of police traps. Bear in mind that in the early years of cycling, there was much antagonism from the Police towards cyclists. 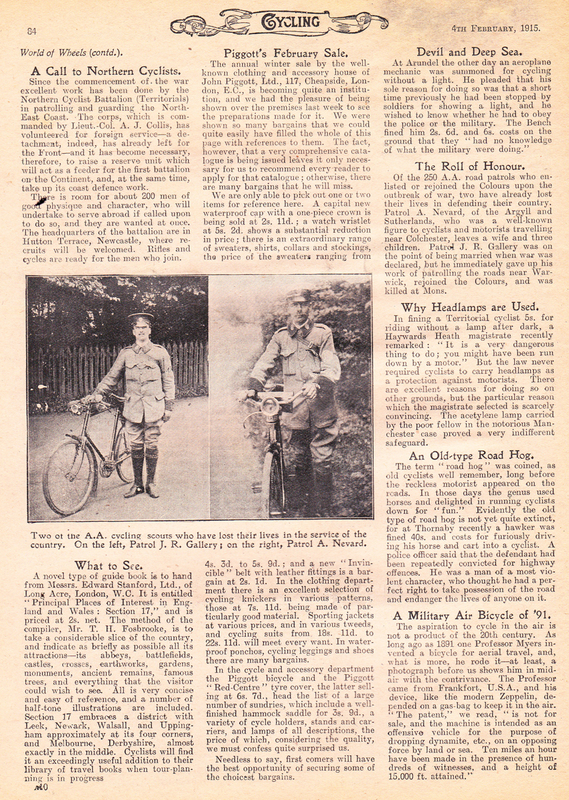 The first bicycle patrols of the new Association started in April 1905. 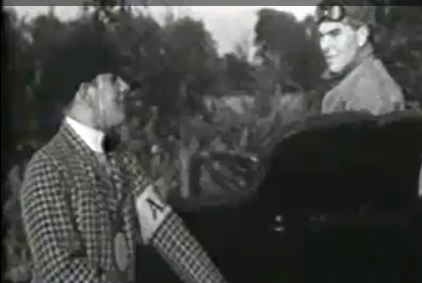 Within months, this informal arrangement of a ‘special staff of cyclists’ was formalized into an organization with a full-time secretary, Stenson Cooke, and was named the Automobile Association. The cycle scouts’ role was to warn AA members of police speed traps ahead (see above photo), and the motorists paid them for their warnings. 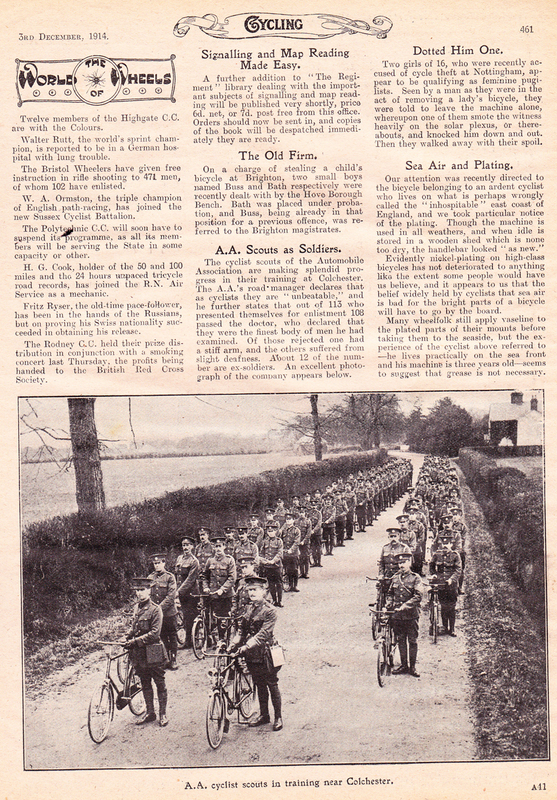 Early AA cycle scouts used their own bicycles, for which they were paid an allowance. Before the introduction of uniforms in 1909, the scouts had to provide their own clothing too. By 1909 there were AA cycle scouts operating all over the country, including Scotland. By 1912 there were 950. The motorcycle patrols, known as Road Service Outfits or ‘RSOs’, weren’t created until 1919. By 1923 there were 274 AA motorbike patrols but still 376 cyclists. 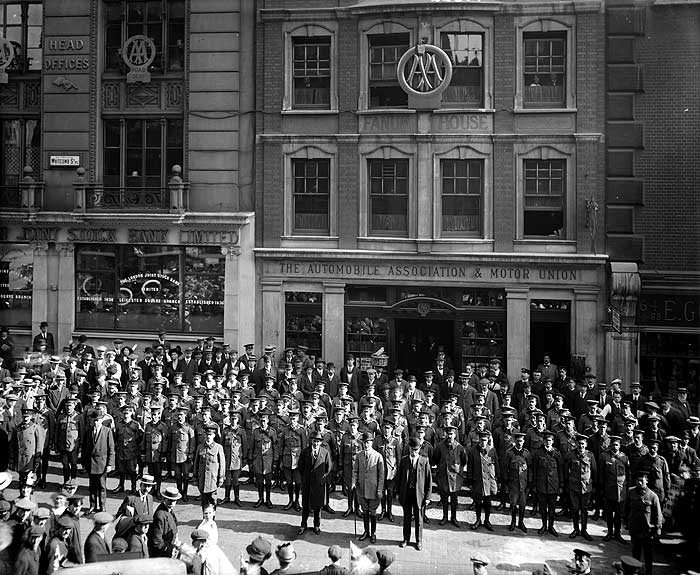 Below you can see the AA Cycle Scouts outside AA headquarters in September, 1914, prior to enlistment.